The 1960 Cincinnati exhibition of Zapf’s work was coinceived [sic] and organized by Noel Martin, who wrote the catalogue. Paul Standard only compiled the three-page chronology at the end. 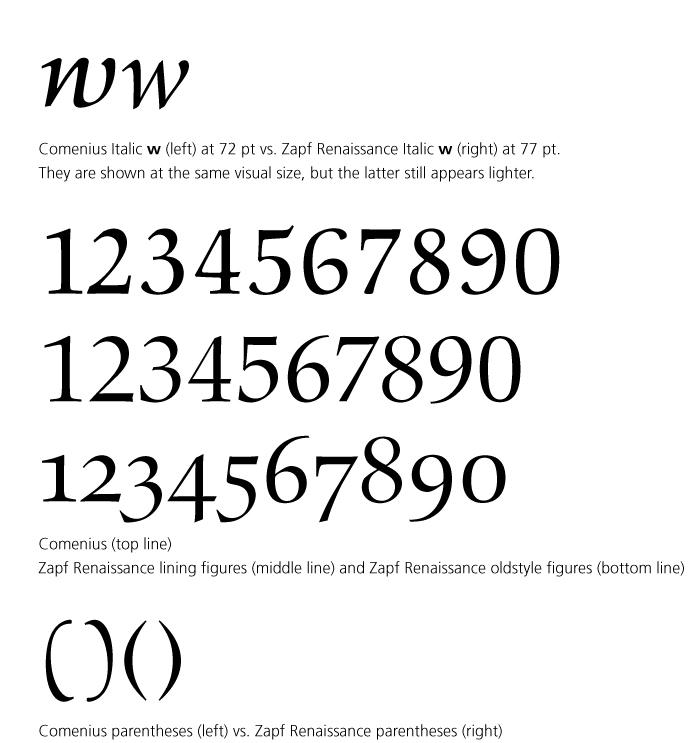 Though it is true that a copyright law involving typefaces was passed in 1973, that does not mean that there weren’t typeface protections in Germany and other European countries before then; there were. See David Pankow, “A Face by Any Other Name is Still My Face: A Tale of Type Piracy”; in Printing History, volume 19, no. 1. Shaw should not mistake the cutesy “brother-in-law” description in the 1960 Palatino type specimen to imply that Kompakt is a member of the Palatino type family; it is not. Surely Shaw would not say that Virtuosa, Saphir, and Gilgengart, all shown in the same text reproduced by Shaw in his response, are part of the Palatino type family. They also are not. The page in question (which Shaw reproduces) lists members of the Palatino type family, such as Sistina, Michelangelo, and Aldus, and later mentions fonts [sic] that, while not part of the Palatino type family, might be mixed with Palatino, such as Virtuosa, Gilgengart, and Kompakt. Even with Shaw’s rather narrow and personal use of the word “orchestrate” I would not say I orchestrated the “Spend Your Alphabets Lavishly” catalogue and “Manuale Zapﬁcum” publication: I wrote some text for each, as I said. The “Spend Your Alphabets Lavishly” exhibition and catalogue were conceived and organized (one might even say “orchestrated”) by David Pankow at Rochester Institute of Technology; he asked me to write the text, and I did. Dave and I conceived of the “Manuale Zapﬁcum” together, and we split the organizational responsibilities. I wrote the Foreword. I am happy to see that the integration of several characters from other fonts [sic] into the Comenius type used for “About More Alphabets” is so seamless that Shaw is “unclear as to what Kelly is referring to when he says ‘It was also bold to substitute many characters from other fonts….’” One would think a teacher of typography and critic would have noticed that the roman parens, italic w, and all the ﬁgures used with Comenius in “About More Alphabets” are from Zapf Renaissance. I take this as an inadvertent compliment. One must be careful about doing such things, however: Renaissance and Comenius have different x-heights, so I had to meticulously adjust the size and ﬁt when doing this. Detail from p. 35 from About More Alphabets showing substituted italic w in “Twentieth”. Detail from p. 16 of About More Alphabets showing substituted parentheses and ﬁgures. Comenius Antiqua specimen book cover. 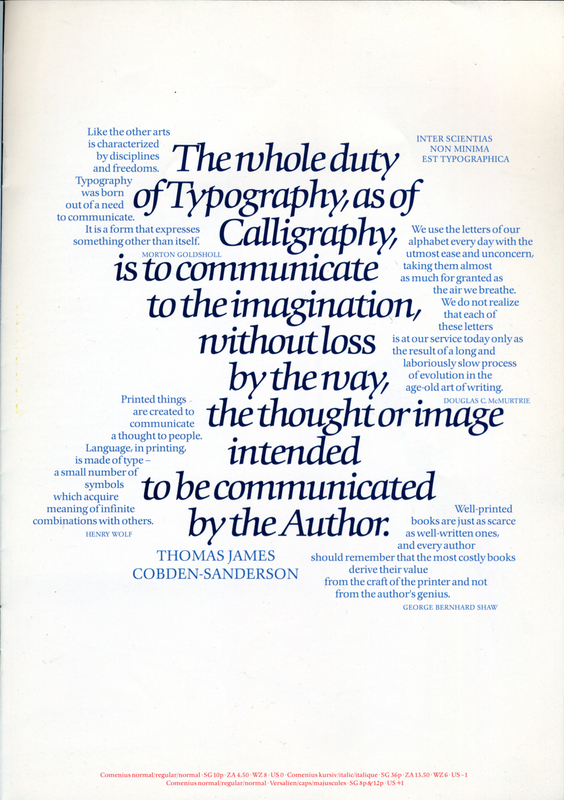 (Berthold Types 167, H. Berthold GmbH, c.1987). Note the emphasis on the odd w.
Shaw asks “ If Comenius is such a handsome face (and clearly intended for text rather than display), why is it rarely used in a book?” Comenius’s beauty as a text face and its rarity are unrelated. Surely Shaw knows that Aldus was hardly used for book composition in the US or England, while Palatino was frequently employed for book work. I think even Shaw would agree that Aldus is a better book type (as Gotthard de Beauclair, Hermann Zapf himself, and numerous others—including me—believe). The reason why it was used so rarely has, not surprisingly, to do mainly with marketing, not its virtues as a bookface. 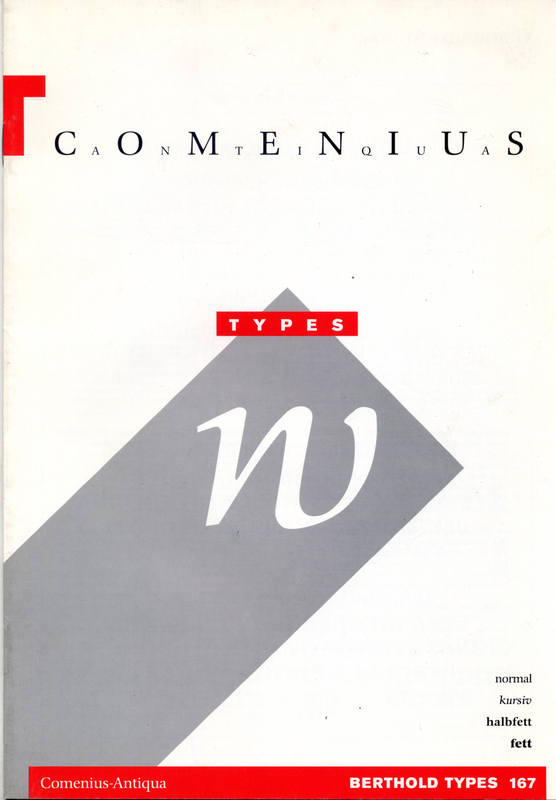 The same is true with Comenius, which was originally produced as an exclusive typeface for Berthold, for use on their rather uncommon phototypesetting system. There were some developments later that I won’t delve into here, but the typeface never achieved the popularity it deserves. The same can be said of many, many ﬁne typeface designs, as we all know. Shaw wrote “The images in About Alphabets are all tip-ins, printed on a deep beige colored paper.” When I pointed out that the images are printed on an off-white stock matching the color of the text paper, not beige, in black (and a screen creating a gray tone) I corrected an error in his review. Shaw now writes, “[t]he color of the stock is irrelevant,” but then why did he mention it? There are more points on which Shaw is incorrect, but I do not mean to draw this out into a lengthy back-and-forth, so I’ll end this here. Again, some of his comments are subjective, and I prefer to leave aside the issue of differing opinions, but there are many factual corrections needed to Shaw’s critique and response. I offer here a few examples, and hope that these and my previous list will sufﬁce, and that we can leave it at that.